Your pesticide storage building should be a safe and compliant means of maintaining your pesticides. Pesticides should be stored in a dedicated storage building, segregated from other hazardous materials, and separated from fire hazards. A containment sump can prevent pesticide storage from entering the environment, without a drain, so the pesticide does not enter the groundwater supply. Mechanical ventilation can prevent the buildup of harmful fumes or dusts, providing enhanced safety conditions for your personnel. The doors of your pesticide storage building should be locked and labeled, restricting access and minimizing the chances of an accidental leak or spill, and alerting emergency responders to the dangers, should they be called to your facility. A pesticide storage building should be furnished with storage racks or shelves to prevent pesticides from coming into contact with the floor. Containers should be labeled and dated, with flammable materials separated from nonflammable. For your protection, follow all safety regulations in the storage of pesticides. If containers are labeled and dated, this enables you to use the oldest container first, helping you reduce the amount of storage you have on hand. It is recommended that you only store pesticides in the amount you’ll need for the season, as this significantly reduces the hazards that accompany pesticide storage. Additionally, company-provided labels on your storage containers include important storage safety information. As with any hazardous chemical, pesticides should be out of reach of children or animals, and segregated from sources of ignition. 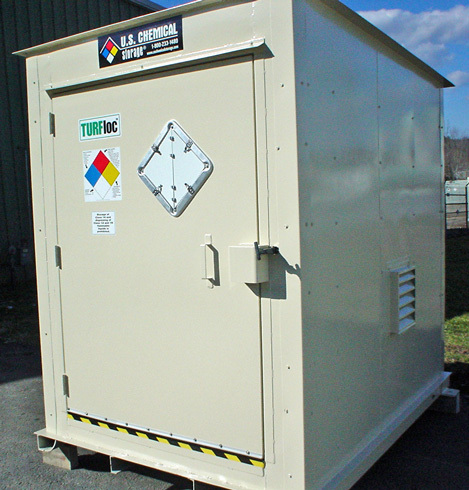 Your chemical storage building should be constructed of materials that are compatible with your pesticide storage, in case of accidental spills or leaks. A secondary containment sump should be capable of holding, at the very least, the same volume as your largest pesticide container. At U.S. Chemical Storage, we provide safe and compliant solutions for your pesticide storage needs. Our buildings are made in America, hand-welded from heavy-gauge steel to provide you with superior durability. Our buildings are weatherproof, granting you maximum protection, even in the harshest weather conditions. A secondary containment sump prevents leaks and spills from escaping your pesticide storage building, preventing environmental hazards. 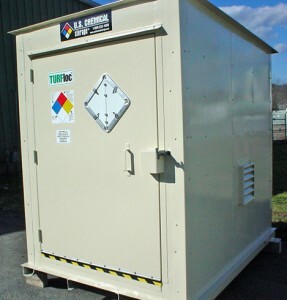 As with any chemical storage, our full line of accessories allows you to fully customize your building for any pesticide storage requirements, including mechanical ventilation to prevent the buildup of harmful fumes, lights to provide full visibility of your pesticide storage, and temperature control systems in case your pesticides require temperature regulation for safety and quality. Whatever your pesticide storage needs, our 100% fully customizable storage buildings have you covered.